Gene Chizik asked Auburn fans to double down on his team early in the season. The night air was still warm when he told a bustling crowd of students he wanted them All In (and all blue) and since then the Auburn Family has rallied to the cause. But if we’re truly All In, then the community itself mustn’t be left out. So now is the time to go All In for Mr. Penny. He’s the gentleman who profoundly impacted members of that vaunted 2004 team and countless other individuals over the decades, big and small, both with and without football pads. And now a group on Facebook is hoping to reward one of those hard fightin’ hard workin’ members of the Auburn Family by sending him to the championship game to help cheer on the team. For free. Why? Because taking the man out of Auburn just means he’s going to bring a little of Auburn with him. Because it’ll be nice to see that familiar, smiling face in the desert. 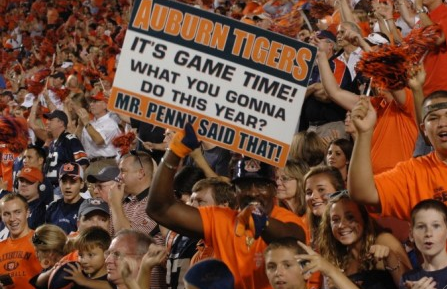 Because it will help prove that the Disney duck has nothing on an Auburn Man. Let’s go, truly, All In. Let’s help send Mr. Penny to Glendale. Mr Penny’s the greatest. I spoke with him at the AU/UGA game, and he said that he’d made a change, he now does FIFTY pushups every time the Tigers score! We’re hearing from people who went last year that the BCS barely sent the Alabama band enough passes for themselves. Greed is ugly, and particularly sour in this economy. I’m stunned by the Facebook ads I’m getting, offering air/hotel/ticket packages for “only” $2,700 per person. It’s like the Super Bowl: Most of those seats will be filled by corporate sponsors, not actual fans. How the university divides their tickets is up to the university. For this game Auburn received 17,000 tickets at face value of $300 and $325. The band has to pay for tickets too and those come out of the 17,000 allotment. For regular season games a visiting university gets 10% of the stadium capacity and all tickets are at face value (alumni, students and band). This is why some schools send only a pep band to some games. They can’t afford to pay for the entire band to go or they want regular fans and students to get those seats. Can’t believe some of those 2004 players that are in the NFL can’t get together and make this happen. Would be a great gift to Mr. Penny. What can we do to make this happen for Mr. Penny? Is there an account set up somewhere? The info is on the Facebook page. It’s done! Official gift presentation to Mr. (and Mrs.) Penny will be tomorrow (Thursday, Dec. 16) at 1:45 p.m. at Dean Road Elementary School.